Want some new materials to work with, feel like a surprise? Join in the MAANZ Brown Bag exchange! It’s free and you don’t need to register in advance. All you need to do is put a generous handful of mixed tesserae into a brown paper lunch bag, seal it and bring it with you to the symposium. Can’t think what to put in? A good rule of thumb is to put in something you would be pleased to receive. You don’t know who is getting yours and you don’t know what you are getting, so if you have any nice or unusual tesserae in your stash that you think someone would like, pop them in. Start putting bits and pieces aside for your brown bag early, so you have a lovely collection by symposium time. You don’t need to go overboard in terms of quantity, a generous handful is fine, but this year we are suggesting a minimum of either 200 g or $10 value. Please don’t give anything you wouldn’t be delighted to receive yourself! Put in a business card or note if you wish. 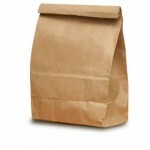 Hand in your brown bag when you register at the symposium. In return, you will receive a raffle ticket. Keep it in a safe place! This year, the exchange will take place at 12:00 on Saturday 21st September. At that point you swap your raffle ticket for a brown bag. Any questions? Email Luna Cameron-Parrish and she will do her best to answer them.